A few weeks before his seventeenth birthday in November 1880, Edvard Munch, who was preparing to pursue a degree in architecture at the time, noted in his diary: "I have dropped out of Technical College. I have in fact made up my mind to become a painter." Shortly after this he attended the University Library in order to "study art history" and also visited exhibitions of contemporary Norwegian painting in the capital with the critical eye of a self-conscious young man. Munch turned to carpentry to make his own easel for painting in the countryside, and started to paint outdoor scenes. Initially he painted the building motifs visible from the windows of his home in a working-class district of the capital, but when autumn arrived, Munch undertook lengthy trips to the countryside and explored all the surroundings of Christiania. As a result he met and made friends with other naturalistic painters who had decided to devote themselves to representing these lesser-known aspects of the city. Munch thus deliberately embarked on the course of Naturalism strictly adhering to the ideas published in the press by his famous relative, the painter Frits Thaulow. Eight months after this important decision, at the end of July 1881 Munch noted in his dairy that he was thinking of going sketching at Maridalsvannet, the last of the lakes that flowed into the Akerselven, the river that provided power to Christiania's growing industries. 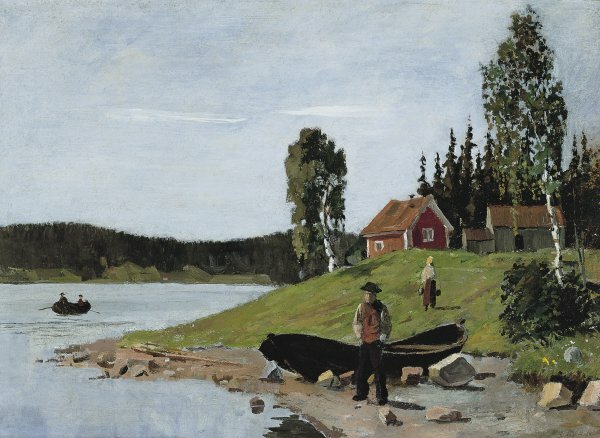 It is very likely that the cottage seen in the painting was located on the northern part of the Maridalsvannet, but later demolished. Drawings and painting of this area made by Munch that same summer are known. As his diaries indicate nothing to the contrary, we can assume that the young artist went on these excursions alone, taking food with him and all the material he needed for working and walking the three hours between his house and his chosen location 12 kilometres away. Or, if he could afford it, he might sometimes have hired a boat like the one seen in the centre of the painting, thus reducing the time of his journey by half. Munch painted his subject at around noon, as indicated by the short shadows casts from the sun in the south. The painting probably depicts the villager and his wife standing in front of their house on the banks of the lake. According to naturalistic ideas of the day, it could be said that the subject is deliberately cut from nature. However, an intricate play of perspectival constructions reveals a deliberate intention to create an interesting pictorial space. The light is conceived in a remarkable way revealing the characteristic atmosphere of this valley which was famous for its light, largely resulting from the abundant birch groves, and described by the Romantic Norwegian poet Henrik Wergeland as "beautiful Maridalen". Before his decision to become a painter, during the summer of 1880, Munch had already painted a series of studies of a birch grove near to his home in Christiania, in the Romantic style of Camille Corot. Now however, after having decided to become a painter, he approached the light in the landscape in a modern way using a modification of the naturalistic French inspired style of the day close to that of Frits Thaulow. As he had heard about, although not actually seen, the radical works of the French Impressionists, Munch focused his palette on the complimentary contrasts of red and green, using the black and white of the tree trunk to mark the extremes of the spectrum. A few weeks after this painting was completed Munch was admitted to the school of drawing in Christiania, where his exceptional talent was immediately recognised and he soon became the most outstanding pupil.